This professional construction manages to treat up to 1,000 m2 with full hopper. The spread width is up to 4.5 m and it has the hopper capacity of 40 kg. 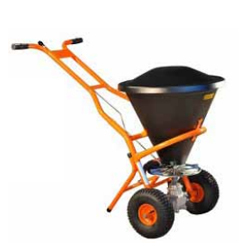 These parameters make this spreader suitable for roads, larger business premises and supermarket parking lots . The drive of the spreading mechanism is derived from the wheels with a metal oil-filled gearbox.